Last week, in the true spirit of Easter, we facilitated one hell of a big egg hunt. 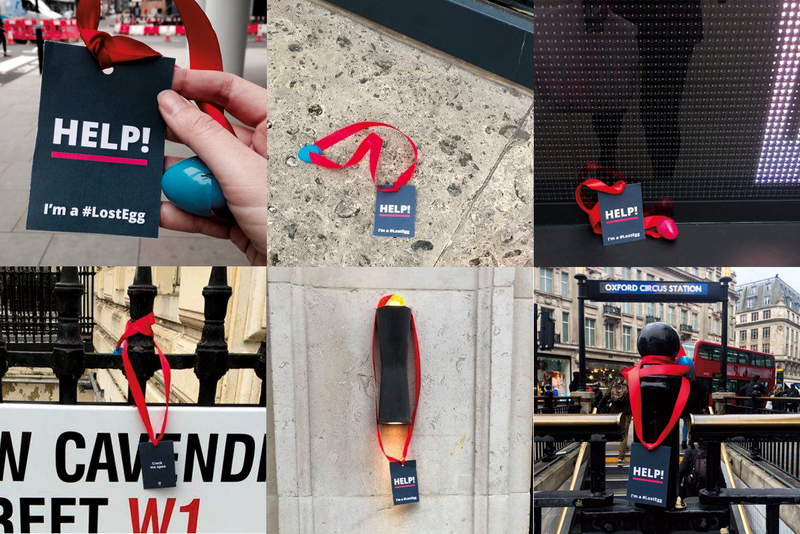 Eggs were scattered all over central London, accompanied by an oversized label stating ‘Help I’m a #LostEgg’ to the delight of tourists and the paranoia of security guards. The whole thing started a mere 16 hours before the scattering began, when our account executive Zoe dropped hundreds of plastic eggs onto my desk, saying “would you eat a chocolate egg that you found on the floor outside?” Being my shameless self, I probably would, but I couldn’t speak on behalf of my fellow public. After a chocolate-fuelled discussion, the big idea was born: the U bird (Underscore bird, geddit) had lost all of her eggs, and it was down to the public to help find them. On finding an egg, the lucky punter was instructed to tweet in that they had found one using the hashtag #lostegg. Of course this couldn’t come without a reward. Arguably better than a visit to Willy Wonka’s chocolate factory, the winner would receive an enormous head-sized Easter egg. 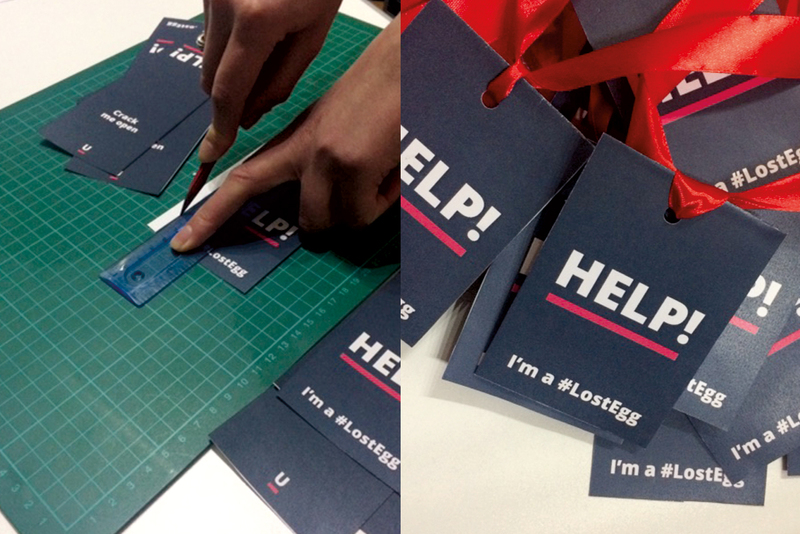 We were now only 12 hours away from the big scatter, and so the printing, cutting, gluing, and tying began. We had quite the production line going, and despite the fact that fingers and eyelids had been glued together, we powered through. The next day, my daily commute entailed walking past some pretty interesting companies, and eggs were strategically hung from railings, tied to door handles, and left on steps, ready to be found by the first eagle-eyed punter. What I didn’t foresee was that the first person to find one of the eggs would be security at the headquarters of one of the largest social media organisations in the world (of who shall remain nameless). I watched him swiftly approach the egg, pick it up and deposit it in the nearest bin. This is going really well, I thought. I decided that I needed to up my game, and possibly look a little less shifty. I moved on to my next target, and was delighted to see, when I got back to the office that we had received a tweet declaring that the first egg had been found. Throughout the day more eggs were found, and to accompany the tweets, people became quite playful with the images they sent in. One showed the egg being hijacked by Lego men; another was strategically placed to look like it was being stepped on by a woman on a digital screen. The mini social media campaign really took off, and keeping up with the Twitter activity was a full-time job in itself. What the campaign proved is that with a really simple idea and fuss-free execution, people are much more likely to engage and respond. Utilising social media platforms also allows a campaign to fuel itself, gain momentum, and pick up traction and interest as it goes along. Finally, a timely social media campaign like this one can help generate genuine, meaningful interaction for minimal effort. #LOSTEGG was not only tons of fun, but received surprising engagement, making a whopping 7662 impressions in less than 4 hours!